French neo-impressionist painter, Georges Seurat, is the subject of the latest exhibition at Kunsthaus Zurich. But with only 60 works on display, many of them studies for larger paintings, it is difficult to tell whether the claim that Seurat is one of the fathers of modern art is justified. The monastic sobriety of the display, despite the wondrous pictures, does little to explain the quasi-religious fervour that Seurat inspires. Georges Seurat (1859-1891) died of diphtheria at the age of 31. During his short life, his artistic output, estimated at around 400 works, was already considered groundbreaking. 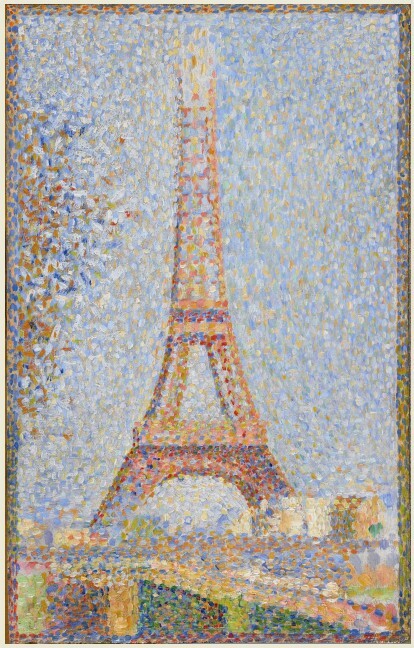 By inventing pointillism, a chromatic painting technique based on tiny brushstrokes of individual colours, Seurat came very close to producing pixels. “What makes Seurat so fascinating today is the variety of approaches implicit in his work” indicates Christoph Becker, Director of the Kunsthaus Zürich and editor of the sumptuous catalogue dedicated to Figures in Space, the title of the exhibition. “What seems at first glance excessively cool and objective in the Pointillist works is in reality the stormy beginning of a new epoch in art that led to the abstraction of classic modernism,” he adds. No less! The exhibition has been laid out in three parts. The first presents the sketches and paintings that led to the large compositions that Seurat prepared for the Paris salons, including the one he founded in 1884 with other artists, when his works continued to be rejected by the official galleries. Seurat’s drawings are instantly recognizable: the silhouettes are not so much drawn as rubbed into high-quality Ingres paper with the dark charcoal and wax of Conté crayons. 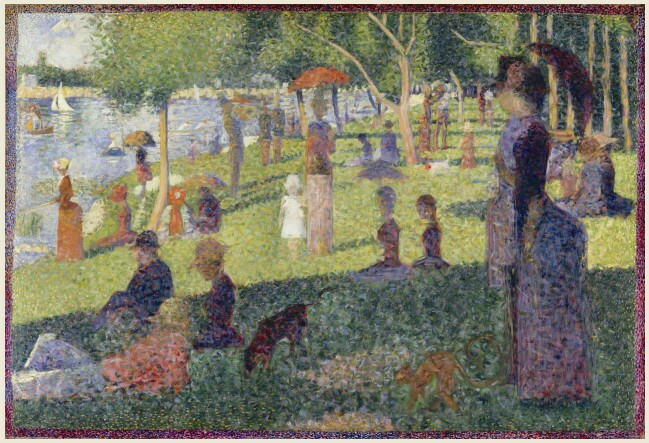 Already the outlines have disappeared, a characteristic that Seurat was to reproduce with his innovative painting technique. Drawings are followed by a series of “croquetons”, early oil paintings on small wood panels no larger than a cigar box. True to the spirit of the reigning Impressionists, who preferred to paint out of doors, the vivid brush strokes were meant to capture impressions, rather than depict reality. “The advantage of these croquetons was that they fit beneath the lid of a small paintbox and could thus be easily carried around even if the paint had yet to dry,” explains Julia Burckhardt Bild, who co-edited the catalogue with Becker. Various studies for well-known works then follow. Although the artistic evolution of Seurat is well illustrated, the display in Zurich stops just short of disappointing. One of the reasons may be that many of Seurat’s works are too fragile to travel, including A Sunday on La Grande Jatte, which is considered his masterpiece and that is now permanently exposed at the Art Institute of Chicago. “Once you have done an exhibition like this, you know why Seurat exhibitions are rare events,” says Becker. He also points out that the painter has always been a collector’s artist and that many of his works have therefore disappeared into private collections. The Kunsthaus in Zurich and the Schirn Kunsthalle Frankfurt in Germany, where the exhibition will move to after Switzerland, have nevertheless secured loans from prestigious institutions such as the Metropolitan Museum of Art in New York, the Phillips Collection in Washington and the Tate and National Gallery in London. Thanks to the many studies, we get a feel for Seurat’s progression into pointillism but the absence of the end result can leave visitors with the feeling that the artist was more a tireless and methodical labourer than an inspired genius. Surely this was not the intent. Nowhere in the exhibition is this more perceptible than in the second section of the exhibition dedicated solely to the seascapes of ports and harbours that Seurat painted towards the end of his short life. They appear strangely inert, not because they are uninteresting, but because the linear display is too monotonous. 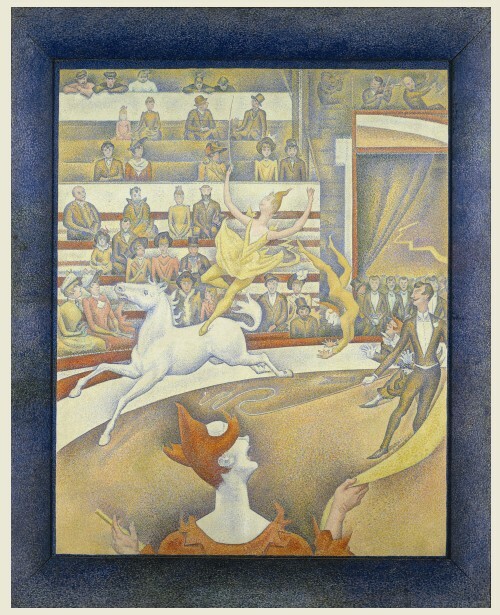 Figures in Space culminates with the world-famous The Circus generously on loan from the Musée d’Orsay in Paris. Chairs are set up in a semi-circle, as if to suggest that we, the on-lookers, are to become part of the event in the circus tent. But there is one painting in the exhibition leant by the Fine Arts Museum of San Francisco that alone makes the trip to Kunsthaus Zürich well worth it. No reproduction, however faithful, can do The Eiffel Tower justice. Painted by Seurat in 1889, as the tower was being finished for the Universal Exhibition of Paris in 1900, it allows the unfinished spire to disappear into the sky. It is the beauty of a technique that does away with boundaries – including the frame – obliging the eye to work differently, that ensures Seurat’s enduring legacy. He was a master of pixels before pixels were even invented.